Consideration of the issue of starting substantive work on the concept of a corvette of the ocean zone, proposed by the Krylov State Research Center (KGNC) in 2017, was postponed to the mid-2020s. About this Mil.Press FlotProm told a knowledgeable industry source. "Due to the lack of funds and the development of the construction of the corvettes of the project 20386, the decision to create a corvette on the basis of the KGNC concept will be adopted closer to the end of the current state armaments program," the source said. A concept project of a multi-purpose ship of the subclass "Corvette" was created in the advanced design department of combat surface ships of the Krylov center. It combines powerful strike armament - 24 vertical launch installations for the “Caliber” - with good seaworthiness, which will allow the corvette to work in the ocean zone. The frigates of the project 22350 type "Admiral Gorshkov" carry only 16 "Caliber". According to the creators of the promising corvette, the construction of such ships should be carried out in a large series using assembly units. The latter will speed up the construction. The source of Mil.Press FlotProm in the Almaz Central Design Bureau said that the concept-project of the Krylov Center does not compete with the development of the bureau: "Naval science moves independently; tests in the KGNTs basins ". The interviewee was skeptical about the possibility of translating the concept into reality. 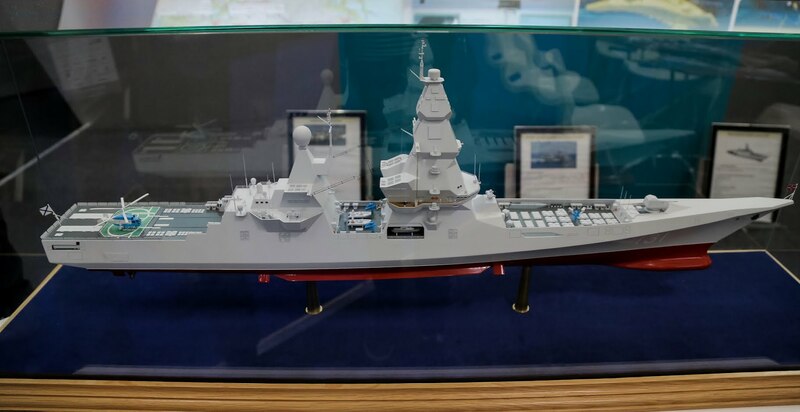 According to the creator of the corvette, the head of the advanced design department for surface warships of the Krylov Center, Valentin Belonenko, the sailors got acquainted with the concept of the ship. Belonenko stressed the high nautical qualities of the corvette. 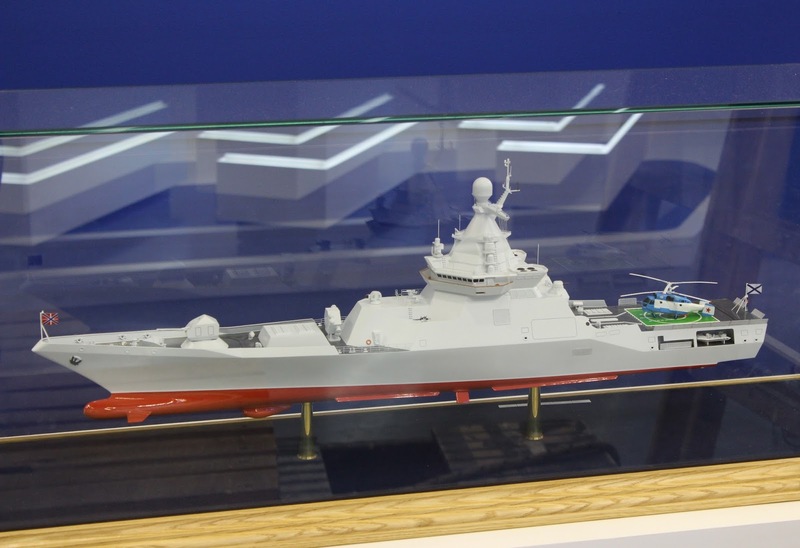 He also noted that the technical solutions that emerged during the development of the concept were used in the construction of one of the newest ships of the Russian Navy. The displacement of the prospective corvette is 2000–2500 tons. The ship’s air defenses are provided by 16 long-range anti-aircraft missiles and 32 short-range ones. It is also equipped with a universal 100-mm automatic gun mount and two 30-mm six- or twelve-barreled rapid-fire anti-aircraft artillery systems. Anti-submarine armament and anti-torpedo protection are represented by two four-tube torpedo tubes “Packet-NK” of 324 mm caliber. Strike armament - 24 Caliber cruise missiles. According to the creators of the concept, their number can be increased if necessary. Although who knows, maybe they are just ''unsure'' again? anime Lider which is going to series ? Lots of missiles tubes is a good thing, but at the end of the day these are war ships that will spend 90% of their operational lives just doing normal things, so onboard comfort and room and food and fuel supplies also need to allow for comfort and reasonable deployment times, and of course good sea keeping is a must. I remember a friend of mine bought a model F-16 that came with a lot of missiles as options but he decided they must all go on at once... so he attached missiles and bombs everywhere... and I mean everywhere... including the vertical tip of the tail had a Sparrow, and the horizontal tips of the tailaerons... he even put weapon pylons on top of the wings... it just looked silly... and if it could have flown would have been a real dog. GarryB wrote: Lots of missiles tubes is a good thing, but at the end of the day these are war ships that will spend 90% of their operational lives just doing normal things, so onboard comfort and room and food and fuel supplies also need to allow for comfort and reasonable deployment times, and of course good sea keeping is a must. is there anything that this ship is missing? 20380 had poor sea worthiness this one good. This project developped now makes others redundant, and this is not in the interest of the Russian Ministry of Defense, that has other priorities, like to allow not holes in the development of the current generation of new armament. The delay until the mid-2020s means this project will be developped then with additional improvements as part of the next generation. And this without count the Projects ongoing that would create more redundancies. 1.- After the approval of the Preliminary Design of new aircraft carrier (likely Project 23000), no-one Preliminary Project more of combat or auxiliary ship will be approved until 2026. 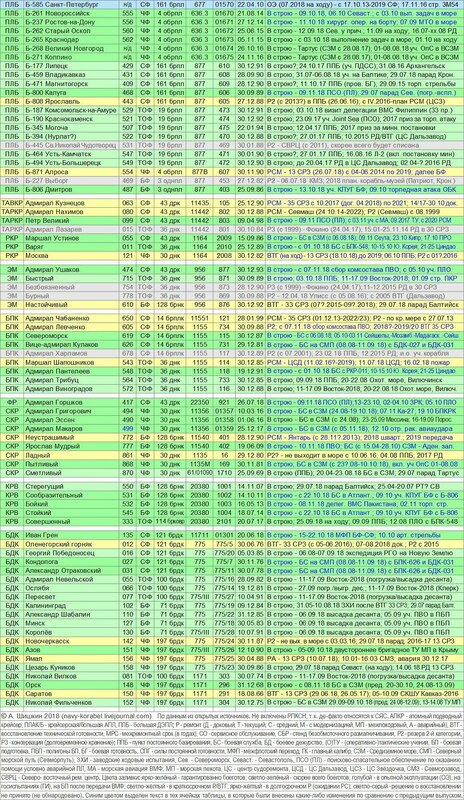 The projects affected would be the Projects of ships of the second link [#213501], not listed here. 2.- The funding for the development of these future projects of the second link will fall to 0 until 2026. 3.- After the order of the first unit of the new aircraft carrier (likely Project 23000) it will not be new orders of new ships of the current projects in production until 2026. 4.- The funding for the ships under construction today will be more strongly adapted to the real priorities of the Russian Ministry of Defense. And from the Russian Gouvernment you can expect also consequences for the leadership of the United Shipbuilding Corporation. The points 1 and 2 explain this new. And this is only the first case. eehnie wrote: The points 1 and 2 explain this new. And this is only the first case. mate, more facts/sources less quotes please. Just because you hate to see predicted things becoming real. From your link: a third carrier design. Seems to be a supercarrier. Seems to be btw kuznetsov and nimitz classes. 70kt class ? There is a text with the picture. Maybe someone can translate ? “PATIENCE YOU MUST HAVE my young padawan"
1) On the blower on this day was the mock aircraft carrying cruiser. 2) In a wind tunnel, several problems are solved. First, how the ship will behave under the wind of various directions and strength. Secondly, how the wind will affect the safety of aircraft to eliminate accidents. 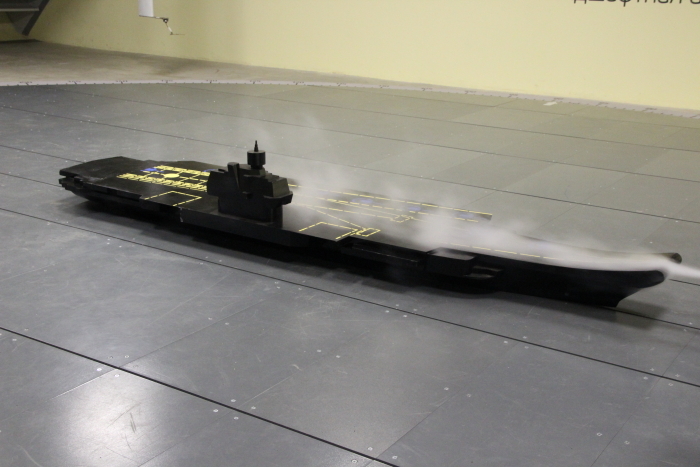 3) For greater visibility of the air flow during the test, smoke is used. - The rupture of the first contract of the Be-200. - The help to Syria with L-39. - The absence of war with the Kurds in Syria. - The replacement of Msta-B in active service by Msta-S in the reserve in Russia. - The absence of the Rysachok aircraft in the Russian Armed Forces. - The absence of the SR-10 aircraft in the Russian Armed Forces. - The absence of the MiG-AT aircraft in the Russian Armed Forces. - The failure in the tests of the Diamond DA-42 aircraft, that leads to absence of procurement to the Russian Armed Forces. - The begin of the replacement of unarmoured tractor elements by armoured tractor elements in a good number of land based Surface-Surface, Surface-Air systems. - The presence of the Project 23560 in the State Armament Program 2018-2027. - The presence of the future Russian Aircraft Carrier in the State Armament Program 2018-2027. - The presence of the MiG-41 in the State Armament Program 2018-2027. - The increasing of the future use of helicopters for Airborne Troops. and a good number more. any ideas of whats getting delivered this year including the repaired ones???? "On April 23, several blue water ships will be laid - two frigates of project 22350 at the Svernaya Verf (Northern Shipyard) in St. Petersburg and two amphibious assault ships of project 11711 at the Yantar shipyard in Kaliningrad," Shoigu said at a distance conference on Tuesday. "Alongside this the Northern Shipyard will couple two major hull units of the project 20386 corvette. It will be named after the military brig The Merkuriy, whose heroic feat will turn 190 in May," Shoigu said. The Russian Navy currently has only one frigate of project 22350 - The Admiral Gorshkov, which entered service in July 2018. It is expected that the Russian military in December 2019 will receive a second ship of this type - The Admiral Kasatonov. 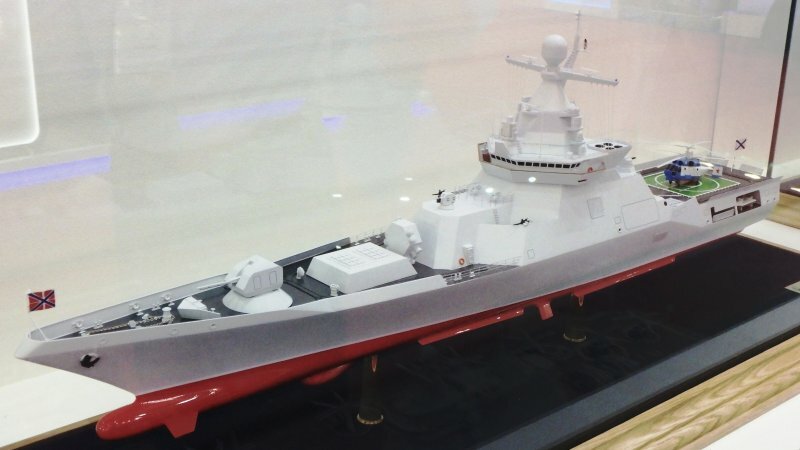 The Northern Shipyard is building two more frigates of project 22350. Well atleast they are finally making more frigates hopefully it doesn't take them over six years to get these ships out.